October – the 10th month of the year. In October autumn is at its peak and shows us what green leaves are able to do: they turn colour in all different shades, red, yellow, orange and brown. They swirl through the air, pile in heaps, you want to let yourself fall into. Preview October calendar sheet with autmn decoration, all 31 days of Octber, Calendar Week and important holidays and dates - and space for remarks. In October we have decorated our home in autumnal colours and with autumn decorations. Chestnuts, cones and other things we have found when walking through the woods, shining red rose hips, ivy and other plants that love to climb. Every year in autumn we make an ivy wreath – you can do this craft together with your kids. We have already prepared an instruction and some photos of our self made wreath with ivy, you can as well use Virginia creeper or other non-poisonous evergreen climbing plants. Autumn is a season we especially love: farewell to the hot summer months and hello to everything that might come along. We don't miss summer all the much, because we know that soon the best time of all is approaching: Christmas. But until everything is glittering and shiny we take advantage of warm summer days and spend them outside, the rainy autumn days are used to finish all the work inside, work, homework and lots of crafts, new patterns, new inspirations and advent calendar. We know that we are a bit ahead of time, but for our customers we don't mind to prolong the preparation time before Christmas. What a great luck, that the whole MiaDeRoca team loves Christmas. Another important date not to forget in October – the change of summer time to winter time. The clocks are changed on October 30th. That means that we are all allowed to sleep a little longer. For all the early birds it means that they have another hour to savour their breakfast. Our autumn breakfast tends to be more of a brunch with some British inspirations like porridge (we prefer it boiled in milk with fruit), baked beans, Austrian ham, Tyrolean speck, scrambled eggs and of course grapes, damson and pears and other seasonal fruit. That is the perfect preparation for Austrian autumn weather. 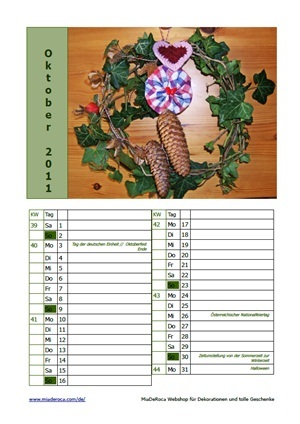 You can print out the October calendar sheet here.